Najaf Khan is known as the most powerful Mughal General, during the dying days of dynasty. He strengthened the Mughal army by introducing better battle formation and weapons. He is also known for the introduction of ‘Firelock’ musket into the Mughal Army. He fought under the Mughal flag in the famous Battle of Buxar in 1764. During this battle, he was part of the Oudh Army. 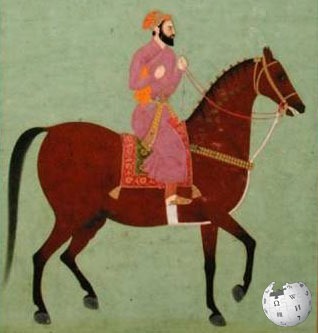 Later, in 1772, he was moved to Delhi to serve as the highest commander of the Mughal Army. He served this rank only for a decade, which was enough for him to streamline the soldiers and train them with better techniques. His army had around 90,000 highly trained soldiers and 250 canons. Soldiers were paid timely premium salaries to ensure the best out of them. In times, when Mughal court was not very strong, Mirza Najaf Khan managed to keep the loyalty and moral of soldiers high. It was his vision and expertise, that made Mughal army one of the strongest in country. Even Frenchmen and other European soldiers found their way into his army. Mirza Najaf Khan realized that after British (who were more like allies than enemies now), the biggest threat is from Rohillas and Sikhs. He marched several kilometers away from the capital of Shahjahanabad to establish a military outpost, which would guard Delhi against such attacks. He built a strong fort, known as Najafgarh. Today, only one gate of this fort survives. 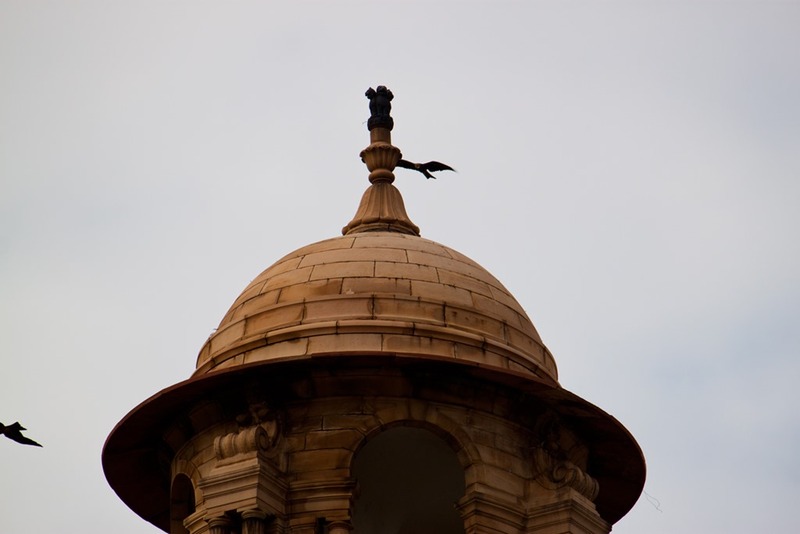 Some say that the Stable and Mosque also survived, but are now being used as some government buildings within the Najafgarh town. 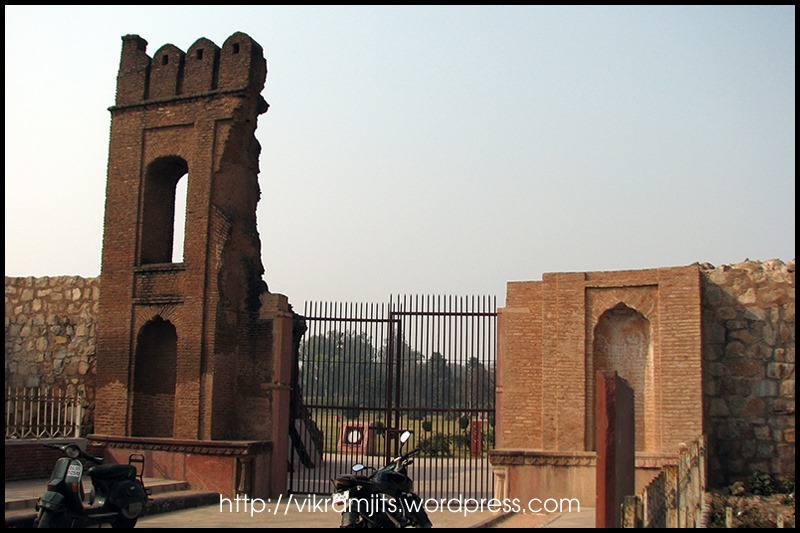 Najafgarh is also known for the battle of Battle of Najafgarh, fought during the siege of Delhi in 1857. After the death of Najaf Khan, the (fort of) Najafgarh became a stronghold of Zabita Khan, the Rohilla Afghan chief. 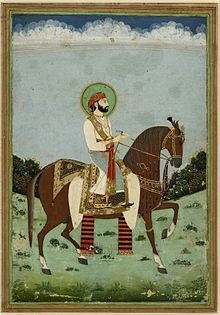 Mirza Najaf Khan Baloch died on April 26, 1782 in Delhi. He left behind an adopted son named Najaf Quli Khan (Not8 to be confused with the Quli Khan buried in Mehrauli Archaeological Park, behind Qutub Minar). It is said that his son had converted from Hinduism. He was nowhere close to the strength and talent of Najaf Khan Baloch and could not succeed him. 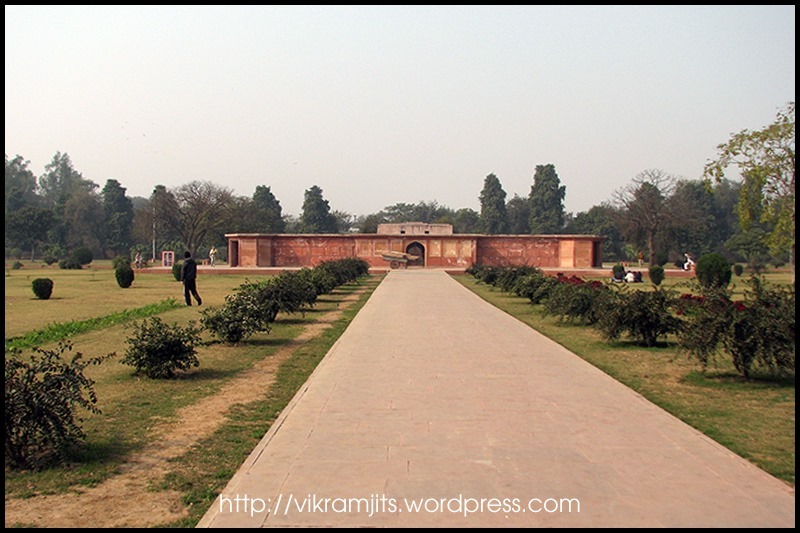 His Tomb is probably the last Charbagh of Delhi. It is an unfinished structure, with only the crypt connected to four corridors. The platform on top contains a rough cenotaph. 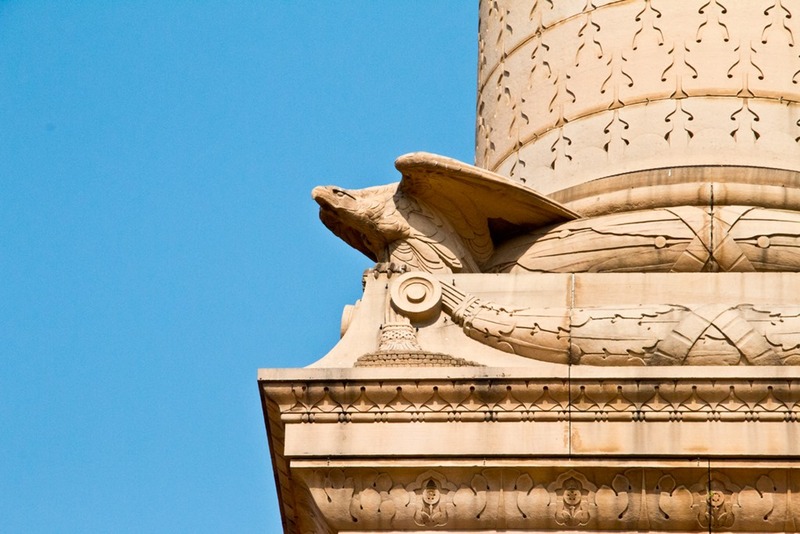 A proper building must have been in plans but during the dying days of empire, there was no one to finish the project. This brave soldier rests in a corner opposite the Safdarjung Airport. In less than 12 months of his demise, Delhi was attacked by Baba Baghel Singh Dhaliwal. 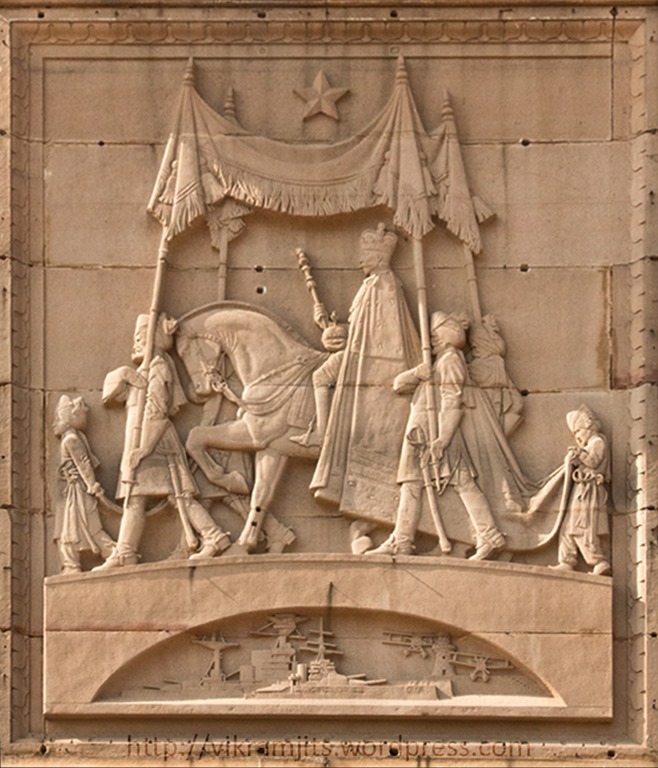 The Red Fort was captured and emperor had to run away. He entered Delhi through a hole in wall near Kashmere Gate, where his 30 thousand soldiers had camped (We still call that place tees-hazari). “Hole” in punjabi is known as “Mori”. Some claim that Mori Gate is named because of that hole made by Sikhs. He was supported by soldiers from the armies of Sardar Jassa Singh Ramgharia and Sardar Jassa Singh Ahluwalia. As they captured the Red Fort, Maharaja Jassa Singh Ahluwalia reached Delhi and Baba Baghel Singh decided to install him as the Emperor of Delhi. This was protested by S. Jassa Singh Ramgharia and S. Ahluwalia voluntarily stepped down before coronation. The Mughal Emperor then sent Lady Sombre (Begum Samru) to Delhi to strike a deal between Sikhs and Mughals. A treaty was signed and Delhi was released by Sikhs. In some future article, I shall detail out the treaty, and how Sikhs Shrines of Delhi were given to Sikhs as a barter. In next 5 years, the Mughal Army seized to exist. Mirza Najaf Khan Korai Baloch was the Last Brave commander of Mughal Army. Roughly 3000 years ago, when Lord Krishna advocated Pandavas in the court of Dhritrashtra, Prince Duryodhna half heartedly agreed to give five villages to them. These villages were Paniprastha (now Panipat), Sonaprastha (now Sonipat), Bahakprastha (now Baghpat), Tilprastha (now Tilpat, in Faridabad) and largest of all, Khandavprastha (later changed to Indraprastha). These villages suffered badly during the war of Mahabharta in Kurukshetra. While the Pandavas were ruling these villages from their small palace, which they called Indrapatta or Indraprastha, they built five temples in the vicinity. One of these temples is the Yogmaya Temple, around which the town of Yoginipura was established (now called Mehrauli). Transaltion: There are countless villages in the country called Haryana. Villagers there work very hard and are very brave. They don’t fear anyone or accept anyone’s dominion. They are centrally managed from Dhilli. Means, Anangvalu (read Anangpal) is famous everywhere and break skulls of his enemies. He even caused the great Sheshnaag (on which earth is stable) to shake. Translation: In the country called Haryana, which is equivalent to heaven on earth, Tomars built a city called “Dhillikakhya” (read Dhillika). The first Tomar king of Delhi, Maharaja Anangpal had to rule a small piece of land. He had much free time to produce 10 heirs. (Don’t you dare ask me any question about Dhritrashtra, who had 98-100 sons). These 10 sons of Anangpal were sent to rule different pieces of land in the country of Tomars. The second emperor of Delhi, Raja Vasudev Tomar ruled from 754-773 AD. The sixth emperor of Delhi Karnpal Tuar sent 5 of his sons to establish new townships. On 26th April 1005 AD, Raja Jaipal Tuar became the 14th king of Delhi. Before he came to power, he had already fought with the then most powerful Amir Subaktegin of Ghazni (predecessor of Muhammed Ghazni). 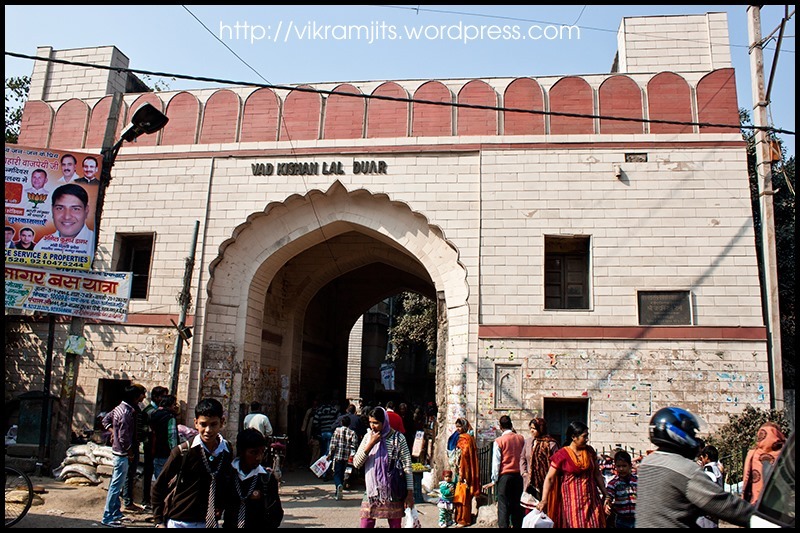 He was later always referred to as the Great Jaipal Tomar, the king of Delhi and Lahore. 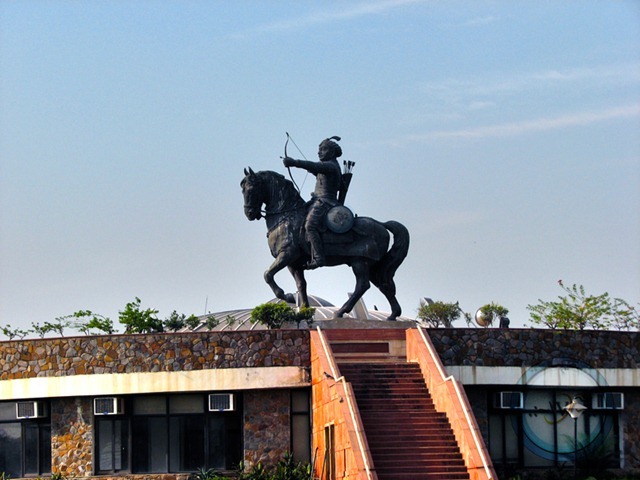 He fought many wars and even lost the kingdom of Kannauj to Rangatdhwaj Gahadavala (Rathore), which plaid an important role in the later history if India. His younger brother Jethpal Tomar captured Paithan and his descendants are called Pathania Rajpoots. Means: Anangpal established the “Killi” (nail) in Dhilli. This tale cannot be removed from history ever. 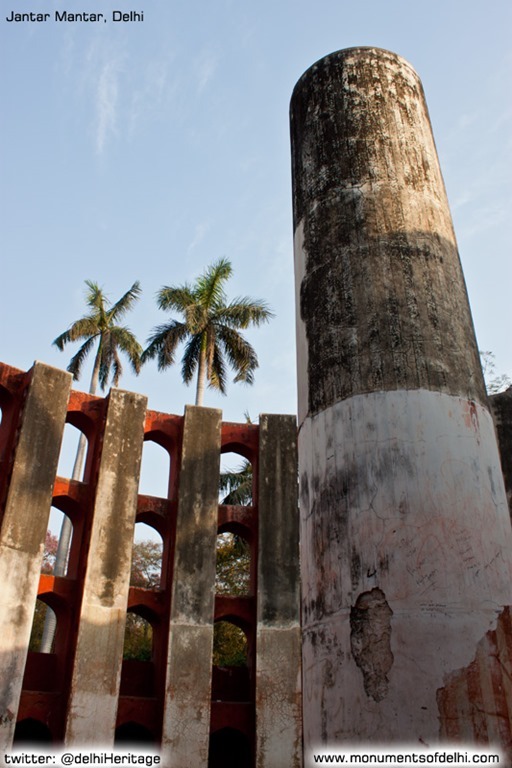 It should also be noted that some historians believe that since this Iron Pillar was not fixed properly, people started calling it “Dheeli Killi” (Loose nail). From here, the name Dhillika came up. However, if this is true, how come we get reference of this name even 500 years before this guy attempted this brave act. Interesting part is that the next king of Delhi, Raja Tejpal Tomar, who established Tejora (between Gurgaon and Alwar) also built the famous Shiv temple in Agra called “Tejo-Mahalya”. This temple was very unique in every sense. Some historians link it with the present Taj Mahal. 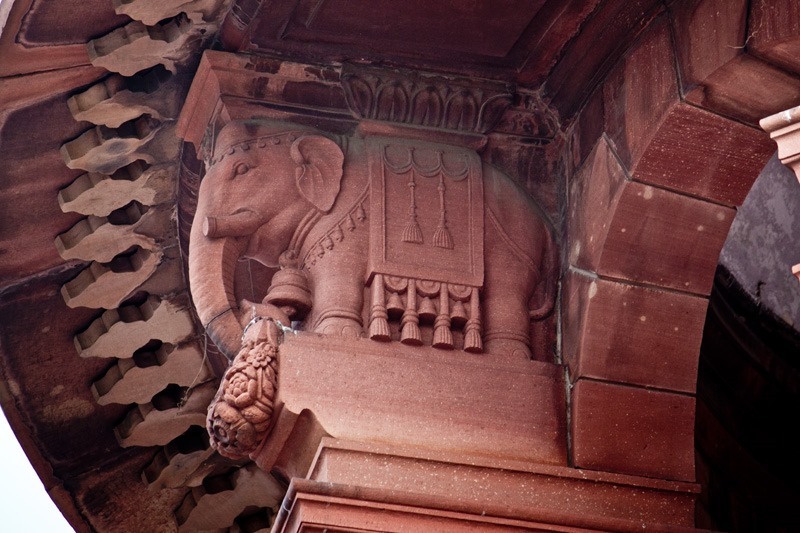 however, it must be noted that no connection of Taj Mahal being Tejomahalya was ever found by any established historians and only few fantasy writers tried to create a hype about it. Indians being very sentimental about the religious structures, easily fell prey to these false claims and started believing in what these writers had to spit. The next king (18th ruler of Delhi), Raja Mahipal Tomar went little to north and established another town called “Mahipalpur”. This town today is near the Delhi International Airport and is flooded with hotels. 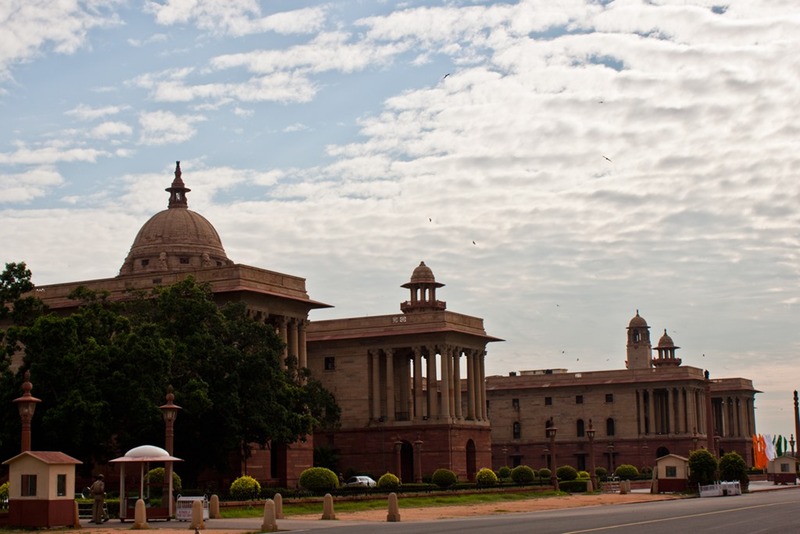 The National Highway 8 (Delhi-Gurgaon Expressway) passes through this historic town. He even got back Hansi and Thanesar (then called Sthaneshwar) from Madud, grandson of Md. Ghazni. 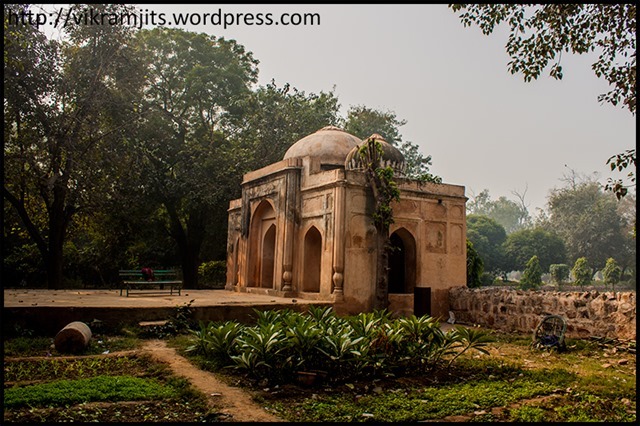 Mahipal also built a water Bund, walls of which still exist between Vasant Kunj and Mahipalpur in Delhi. 19th king of Delhi, Arkpal Tomar, or Dakatpal Tomar or more popularly known as Anangpal III was the last emperor of Delhi from Tomar Clan. 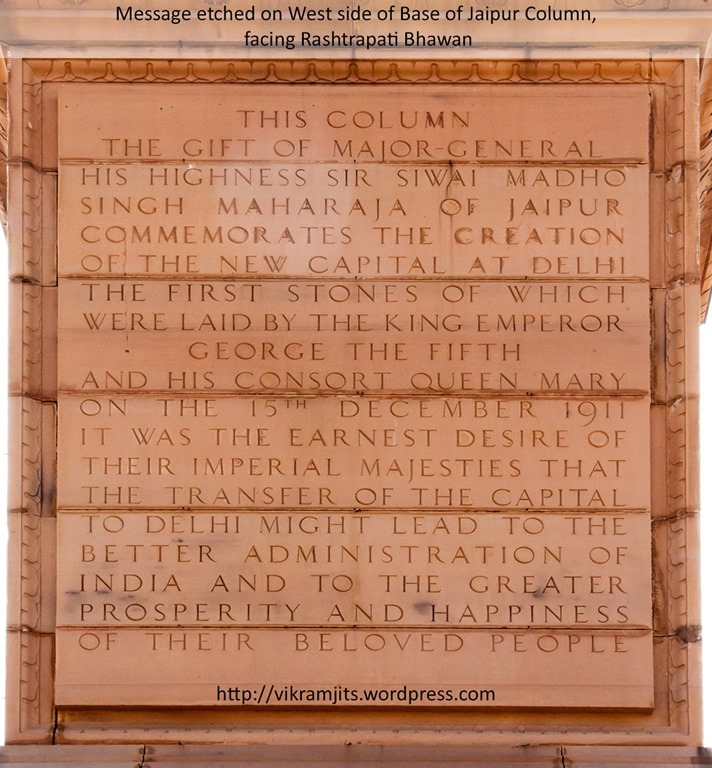 He had his daughter rajkumari Kirtimalini married to Raja Someshwar Dev Chauhan of Ajmer. 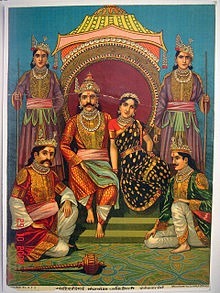 Anangpal III sent his 3 sons to rule different parts of country. Rao Salivaahanji Tomar (Rao Salunji) was sent to rule Tomaravati (aka Tanwaravati aka Toravati), which Anangpal II established in Patan, Rajasthan. It had 380 villages spread across 3000 sq. Km. He became the 1st ruler of this independent territory and his present descendant is Rao Sahib Digvijay Singhji, the head of Tomar Clan in India, who was crowned on 11th September 1991 as Rao of Patan. Rao Ajmalji Tomar, his second son settled at Pokhran and Jaisalmer. One of this descendants is “Baba Ramdevji”, the deity in Rajasthan. 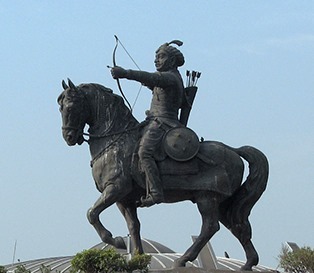 Maharaja Anangpal Tomar III called his daughter’s Son, the great Prithvi Raj Chauhan, the king of Ajmer, and gave him the throne of Delhi before proceeding towards Chambal down south. The marked the end of Tomar rule in Delhi and hence started the Chauhan Clan. Unfortunately, Prithviraj (aka Rai Pithora) was the first and last Chauhan ruler of Delhi. I’ll write about Prithviraj Chauhan and his conquest in later articles. This one was dedicated to Tomars, and especially the “Anangpals” of Delhi. Mamluk Sultan Altamash (Iltutmish) built the Minarah, which till date is the tallest rubble masonry minaret on earth. Then why do we call it the Qutub Minar? The Qutb Minar (also spelled as Qutub Minar or Kutb Minar) is world’s tallest rubble masonry minaret and a world heritage site in Delhi. It is situated within the Qutb Complex, which has been the centre of the first city of Delhi since the first Muslim ruler stepped here. Before Muhammad-bin-Sam (Muhammad Ghori) defeated Prithvi Raj Chauhan, this land was with Tomar Rajpoots & Chauhans (Arkpal Tomar gave it to his grandson Prithvi). Chauhan extended the walls of Lal Kot to create Qila Rai Pithora. Ghori left his governor Qutb-ud-din Aibak to rule India after defeating Prithvi Raj Chauhan in 1060 A.D. and thus the slave dynasty started in India. 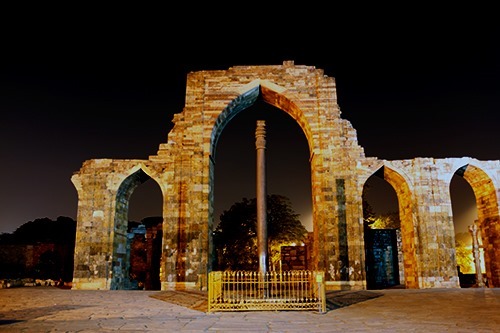 There is a huge minar in the heart of this city, which most people attribute to this first Islamic ruler of north India – Qutb-ud-Din Aibak. But is this true? This article unfolds a story, least discussed in History. 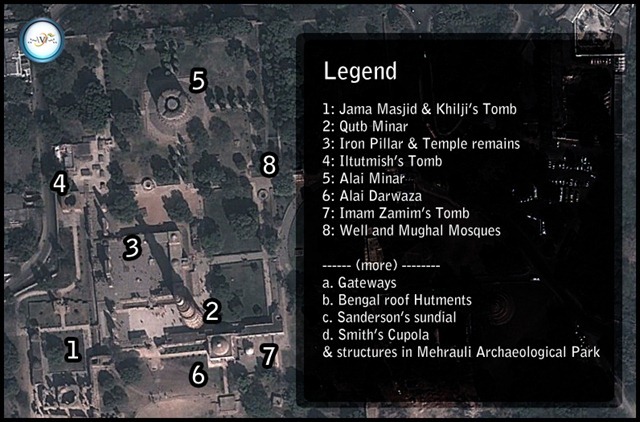 The Qutb Complex was originally a site with 27 Hindu and Jain Temples. These temples were destroyed by the Islamic invaders to obtain stone and raw material for their mosques and other buildings. These temples existed much before Ghori was even born. 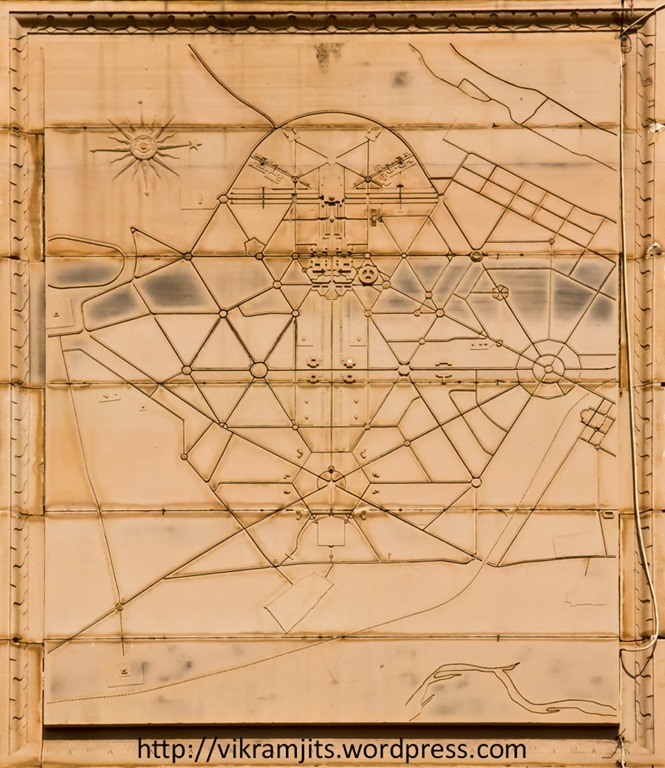 As the rulers from slave dynasty planned their buildings, they were short of raw material. By demolishing the majestic temples, they served another very important purpose. To ensure stronghold, it was important that the backbone of religion prevailing in conquered land is crushed. Destroying temples meant that the new Islamic Invaders had no respect for the religion being practiced by locals. They were in such hurry of completing the job, that they were not able to deface the statues properly. Even today, the remains of temples can be seen within the Qutb Complex. Kutb-ud-Din Aibak, on whom be the mercy of God, constructed this mosque. This fortress was conquered and this Masjid Jami was built during the months of the year 587 by the great and mighty commander-in-chief Kutb-ul-Dawlat-wa-ul-Din, the commander of commanders, Aibeg Sultan. May God exalt his helpers. Materials from 27 idol temples, each of which cost twice thousand into thousand Diliwals, have been used in this Masjid. May Almighty God send mercy on him, who prays for the rest of the builder. 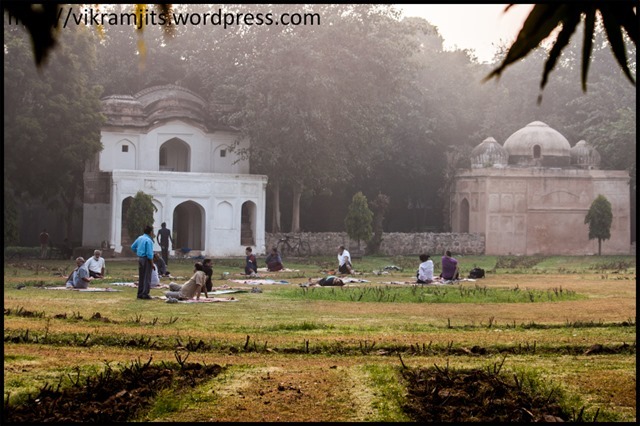 Later this mosque was extended by Alaudin Khilji and a college (Madrasa) was added to it. 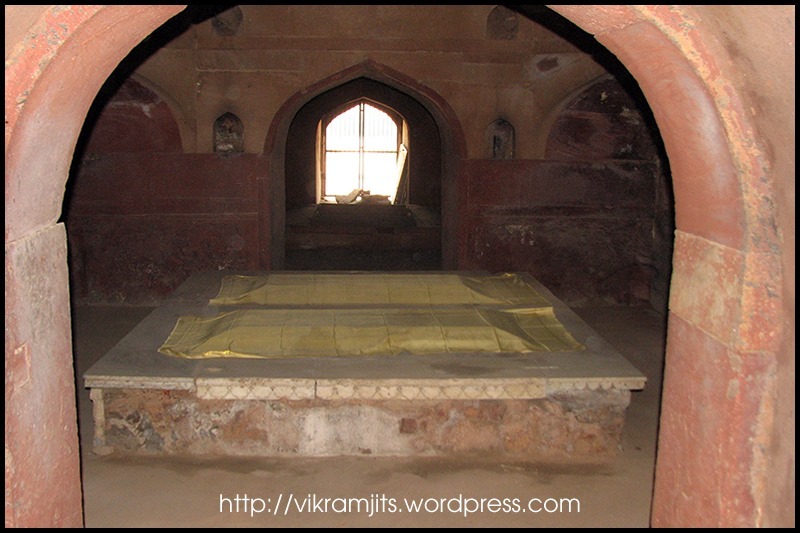 When Khilji died, he was buried in the same mosque and his tomb, though not decorated with glorifying marble and inscriptions, was built in same complex. The above authors make no mention of Minar. If it was one of the biggest construction of era, these people, who were living in Delhi and writing particularly on Qutb-ud-Din Aibak must have mentioned about it. It should be noted that Feroz Shah Tughlaq also repaired other monuments and mention correct names like Hauz-i-Shamsi, Hauz-i-Alai, Madrasa of Altamash, Rukn-ud-din’s Tomb, Sultan Jalal-ud-Din’s Tomb and so on. Tarikh-i-Firozshahi written by Shams-i-Siraj Afif however refer to this Minar as “the large pillar at old Delhi” raised by Sultan Shams-ud-Din Altamash. Ibn Batuta was not sure who built this minar so all he wrote about the builder was “Is it the minar of Feroz Shah”. Babur in his memoirs mention about this minar as the Minar of Sultan Alauddin Khilji. 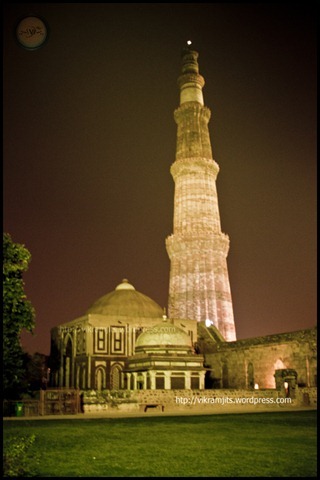 This shows that even till late 16th century, this minar was not attributed to Qutb-ud-Din Aibak. 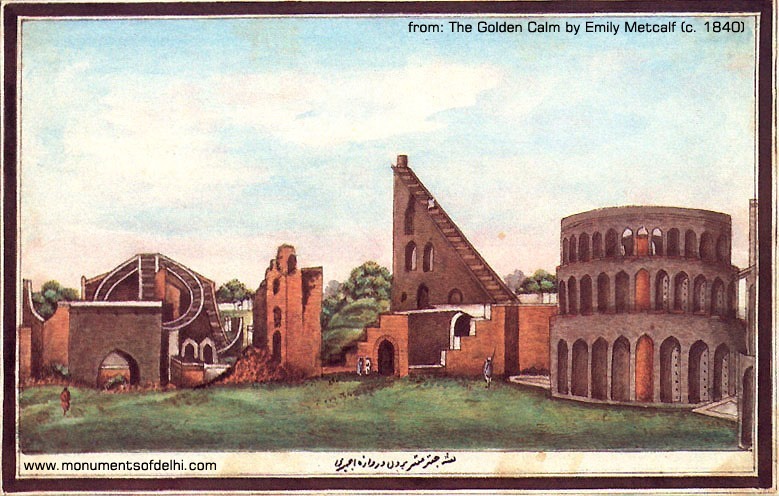 It was known by the names of Altamash, Khilji or Tughlaq, who we know built and repaired portions of minar. The prophet on whom be the mercy and peace of God, has declared “whoever erects a temple to the true God (on earth,) shall receive six such ‘dwellings in Paradise’. The Minar, the building of the king of kings, Shems-ud-Dunya-wa-ud-Din, now in peace and pardon, be his tomb protected, and his place be assigned in heaven ____ was injured by lightning in the reign of the exalted monarch Secander the son of Behlol : (may his power and empire last for ever and his reign be glorious); and therefore the slave Fatteh-Khan, the son of Mesned-Ali the liberal of the liberal, and the meritorious servant of the king _____________, repaired it according to command. The 13th of Rebi-ul-Akher in the year 909. We can see from the above proofs that this Minar was always known as the Minar of Altamash and not of Qutub-ud-Din Aibak. Reputed historian Sir Syed Ahmed in his work Athar-us-Sanadid said that this Minar was actually built by Prothvi Raj Chauhan so that his daughter can have a view of Jamuna river. But if it is true, then its design and architecture must be unique and not match with the other Minars of Islamic countries. Minaret of Ghazni: Built by Muizuddin Bahram in 10th century in the city of Ghazni. It is little different from the Qutb Minar but has many similarities, like built by same generation of rulers and it is also the minaret of a mosque. Minaret of Gutluk Temir in Konye-Urgench: This is the third tallest rubble masonry minaret in world built in Old Urgench city of Turkmenistan in 11th century. Minaret of Jam: This Minaret, very much similar to the architecture of Qutub Minar is situated in Shahrak District of Ghor Province of Afghanistan. It is right next to the Hari River. This 65 metre high minaret was completed in 12th century. This place (called Firuzkoh) was the summer capital of Ghorid Dynasty (from where Qutbuddin Aibak came). This is the second tallest rubble masonry minaret of world and was probably attached to a mosque, just like Qutb Minar. He should have never committed adultery after reaching puberty. He should have never missed the 4 rakat of sunnah(ghair-muakkidah) before Asr salat. The huge crowd stood still ! Hundreas of Awliya , Shyukh of Delhi as well as Shaykh’s senior disciples were present there. No one came forward.Khadim repeatedly announced the requirements. But there was no response. A sense of impatience was being felt. Finally, Sultan Shamusddin Altamash (May Allah have mercy on him) stepped forward. He remarked, “No one knew my secret, the respected Khawaja disclosed it. All praise is to Allah, I fullfil these criteria”. He then led the prayers. 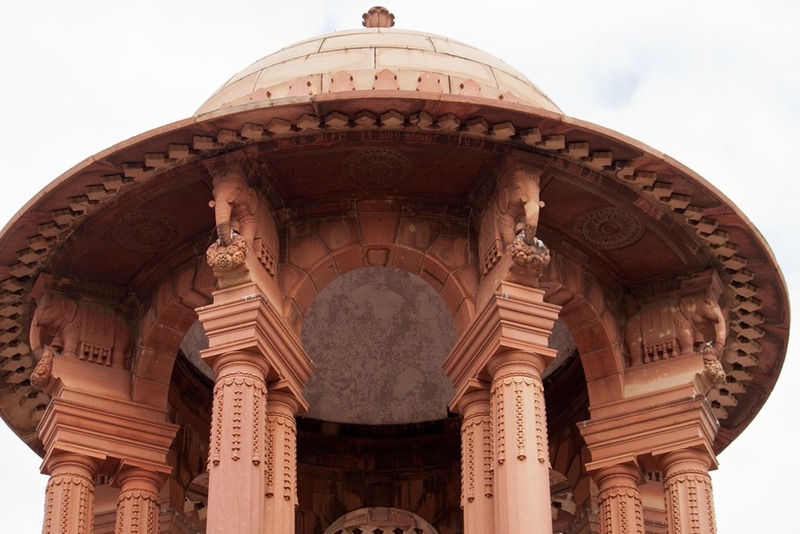 These temples were built in different eras, some even decades apart. There is no proper documentation for each. A portion of Temple is still intact in the Quwwat-ul-Islam Mosque. One should see its placement and design, before reaching the final conclusion. The base has 27 conical edges and 27 circular ones. This makes it 54 at base. 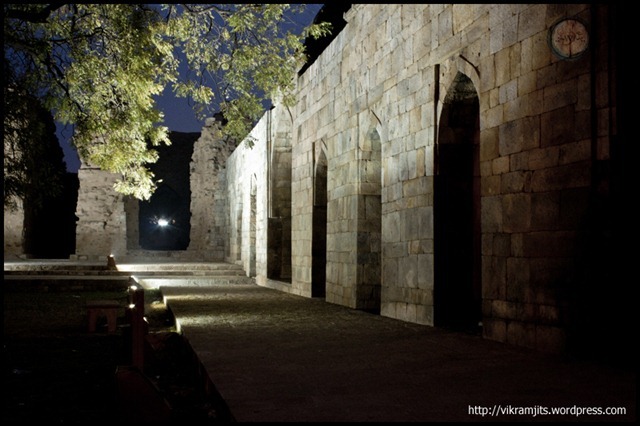 Qutub Minar has a long and mysterious history. People like me will never be able to unfold it completely. However, I have tried my best to put forward the facts that I learned in past few years. Every few days, I get a query about the Mysterious Malcha Mahal. People want to go there and know more about it. They are fascinated because they think that in today’s world, how can someone live without electricity and regular water supply. But things are different for the Royal siblings of the Oudh (Awadh) province. 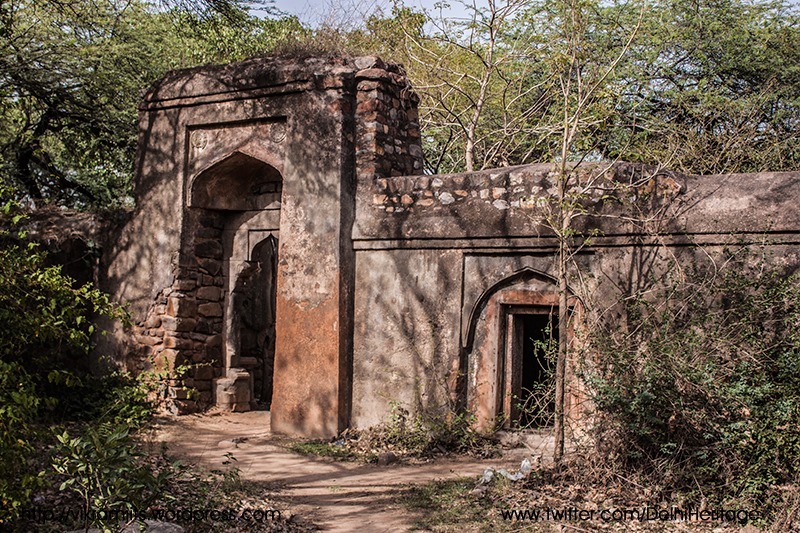 Malcha Mahal is a hunting lodge built by Feroz Shah Tughlaq in 14th century. 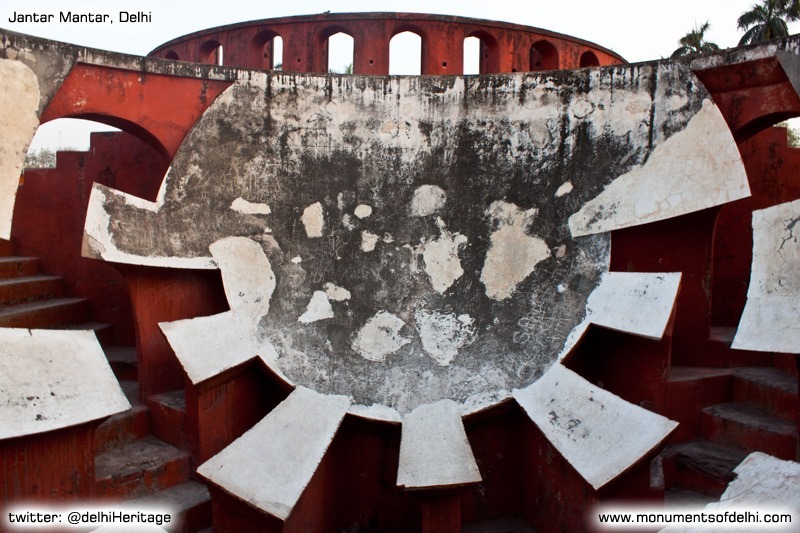 Situated right next to Delhi Earth Station in the restricted area of Delhi Ridge, this monument is largest of all Shikargaah’s built by the emperor. It is a huge square complex of 30 meter length on each side built on a high mound. 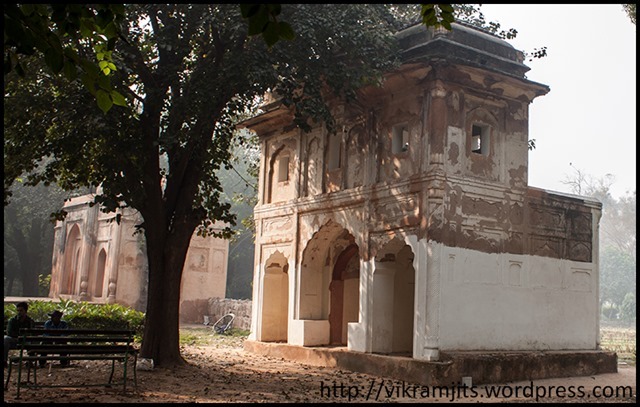 The architecture of this lodge is somewhat similar to another of Tughlaq’s hunting lodge, Kushk Mahal (inside Teenmurti House). 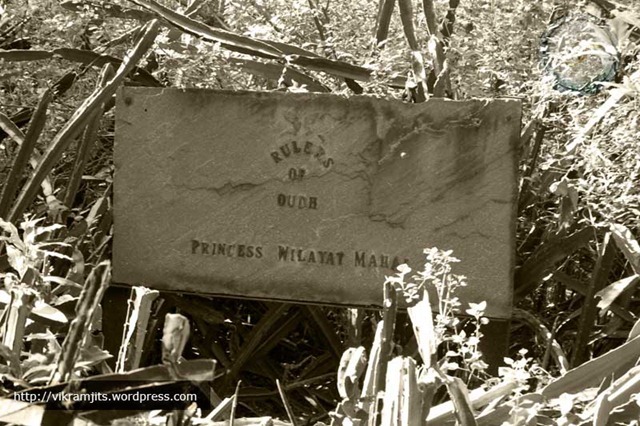 Princess Wilayat Mahal, the Begum of Oudh was the great granddaughter of Nawab Wajid Ali Shah of Oudh. Nawab Wajid Ali waas deposed by British more than a century ago and their property was seized. Begum Wilayat Mahal was fighting with the govt. 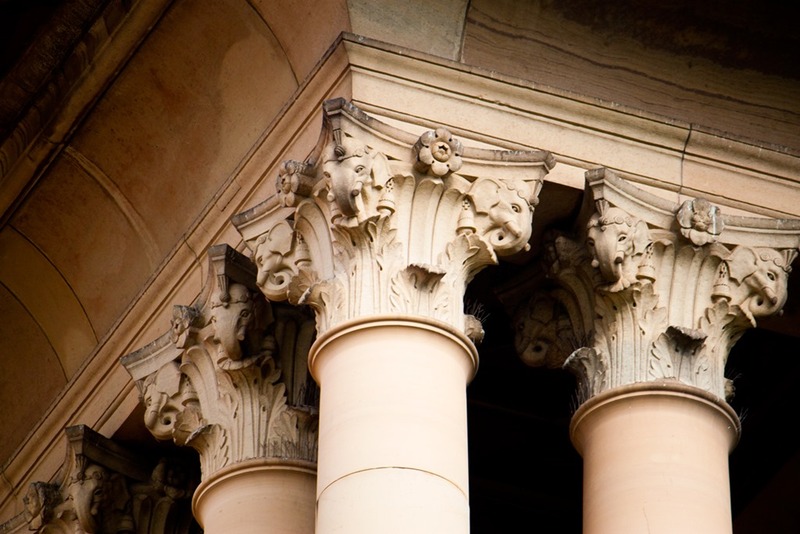 of India to get her property back, which is now used as a pharmaceutical research centre. To humiliate the government, she housed herself in the VIP lounge of New Delhi Railway Station with her two kids and dogs for a considerably long period. In may 1985, the govt. finally decided to allot Malcha Mahal to this royal descendants. But placing a royal family in such a ghost palace was not a good idea. On December 10, 1993, out of pain and mental stress, Begum Wilayat Mahal committed suicide by drinking crushed diamonds. She left behind her two kids, Princess Sakina and Prince Raza, few Dobermans & German Shepherds and some royal treasure. Her body was lying on her study desk for 10 days and her kids were mourning in grief. The night before Prince Raza buried her, both her kids slept with her dead body. Since her mother’s death, Princess Sakina has only wore black colour. On june 24th 1994, some people tried to attack this haunted place in search of treasure. The terrified young siblings had to dig the grave of their deceased mother and burn her body to save her grave from being vandalized. Today her ashes rest in a crystal vial. They were given a revolver and permission to shoot in self-protection by the Lt. Governor of Delhi. 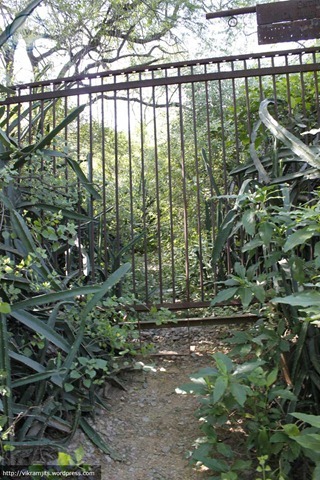 Today, the dungeon is guarded by less than a dozen dogs and high shrubs and grills around the premise. They once had 27 dogs but today, only 9 are left. Others have been poisoned by local thieves, who have also stolen a huge silver table some some gold and silver tableware from the palace. Out of my several visits to the place, I was able to talk to few people there. In one visit, I was able to talk to the local forest officials. They said that it is a false claim that she was allotted this palace permanently by government. It was more of a make-shift temporary arrangement to pull her out of the New Delhi Railway Station. He further went to an extend saying that in the initial days of Begum Wilayat Mahal coming to this palace, they used to hear sound of music and dance from the palace. They even told us that they fear some illegal activities going in there. They could recall 1-2 reporters trying to go inside the Mahal and never return back. I even had a conversation with the CISF guards at the Delhi Earth Station. They told me that they have no clue what happens in there. All they know is that if anyone tries to come near, this guy unleashes his dogs and points a gun at the intruder. I was lucky enough to talk to one employee of the Earth Station. 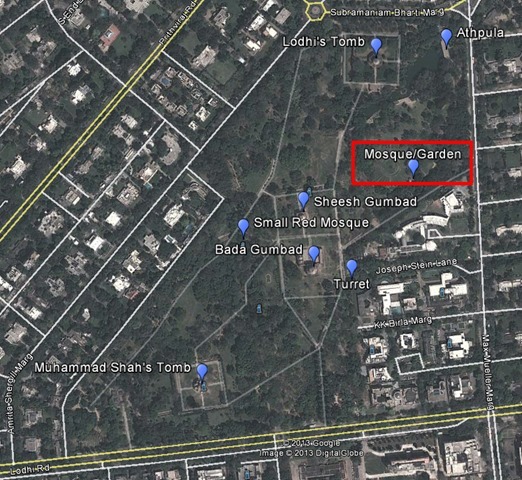 He said that he has been working in the Earth Station for decades and this palace, which is just few feet away from the Station used to be their badminton court. But since these people have come here, they have not allowed us to go near the palace. During one of my several visits, when I was trying to find the entrance to the palace and was being accompanied by few other members of our Photowalk Group (Nikhil Garg, Karan Arora, Pankaj Pratap Singh, Praveen Lal, Sourabh Singh Khillery and few others) we were lucky to have a look at the guy, who we later realized is the prince himself. We were amazed by his command over English. We tried to break the conversation with him but he quickly jumped into the bushes and disappeared. I don’t know whether Prince Anjum Quder is right or the story told by Begum Wilayat is true. All I know is that Princess Sakina and Prince Raza deserve a peaceful life. They have had enough torture and pain in all these years. We cannot estimate their loss. Today they share a haunted dungeon with bats, lizards, spiders and snakes. They live a life of refugees in their own country’s capital. Government and other people, including their own servants have betrayed them so many times that now they can’t trust anyone but their dogs. The best we can do today to help them is to let them live peacefully and not force our curiosity to breach their privacy. Let’s stay away from Malcha Mahal and let them live the life they have chosen for themselves. It is their basic right and we are no one to force a lifestyle on them, which we think is better. – Whatever people say about the siblings living in this palace, I have my full sympathy with them and would like to support them in the way, in which they are most comfortable. “I went there with my photographer, jumped the fence and went inside. An old dying lady was lying in one corner. When she saw me, she screamed and called someone. She asked him to unleash dogs and pull out gun. I ran away. After coming out, I phoned police about some suspicious activity and had the place raided. As police came, I went inside with them showing my press card. When we went inside with police, we found that they are very poor. They had few dogs. There were hardly any utensils in the room and very few traces of food. Entire structure was checked by police this is all we found in there”. He added, “Policemen were also cribbing about this false alarm, and so were the old duo living in there”. This reporter, from India TV was very proud of his act. After narrating his gallantry act, the reporter invited me for an interview, to which I refused (obviously). I have appeared on many news channels and this channel will always remain in my black list. Once I went to Malcha Mahal and the Trees had shed leaves, revealing the Monument. I was able to get a clearer view and found that it is more closer to Bhooli Bhatiyari ka Mahal built by same, Feroz Shah Tughlaq, than the Kushk Mahal (as said by me earlier in this post). It is on high mound, with a huge gate, accessed by a ramp, instead of stairs. 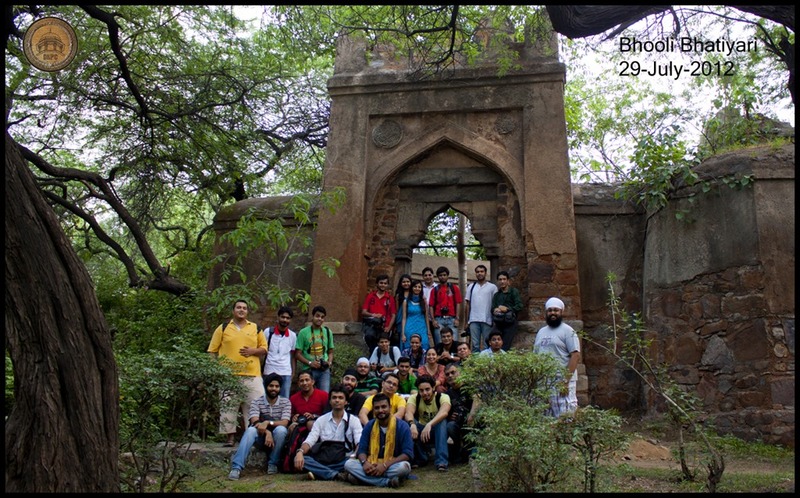 Outside the Monument, towards west (Qibla), is a Mosque Wall, which touches the boundary of Delhi Earth Station. This is a rare thing as nowhere else, I have found any such wall near any Hunting Lodge. Usually, prayer chambers are inside the premise of lodge. There is a possibility that this mosque wall was built later. Exact statement can be given only after proper examination of the wall. At end, all I want to say is, please don’t try anything, which can disturb the peace, with which the duo is living. They have right to live. Please let them live peacefully. We can see the monument from inside few years later. All of a sudden, the newspapers are flooded with news of Prince Ali Raza or Prince Cyrus (as he wanted himself to be called) passing away. He passed away on 2nd of September, 2017, 4 years after his sister passed away. The Monument now lies empty and the authorities will clean it soon (hopefully) for the public to access. When reporters reached the palace, they found some old dilapidated furniture. The only thing in order was a table with nicely places porcelain tea set. There was a glass of water and plates set, as if someone was about to have dinner. Perhaps, the deceased prince was about to have dinner, when he left this mortal world.